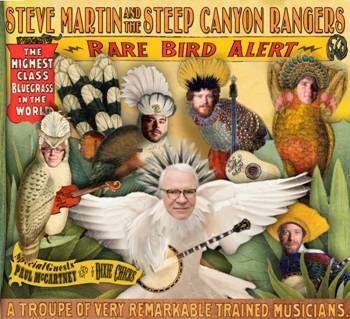 Tickets went on sale at 9.00 a.m. today for a three-show tour in Britain by multi-talented award-winning actor/comedian/musician and bestselling author Steve Martin and the Steep Canyon Rangers. They will be touring the UK in July, in support of their new Rounder album Rare bird alert, which is scheduled for release on 13 June. Rare bird alert - a follow-up to Martin's Grammy-winning 2009 Rounder release, The crow - features thirteen new compositions by him, two of which were co-written with the SCR. It was produced by Tony Trischka. It also features special guest vocal appearances by Sir Paul McCartney and the Dixie Chicks. Tickets are priced between £28.50 and £40.00 (subject to a booking fee) and are available online. For further information, music, photos, e-mail. For tour inquiries, please contact Steve Guest, head of PR, Live Nation UK: e-mail, 'phone +44 (0)207 009 3371.